DENVER—Team sources confirmed Sunday that members of the Denver Broncos' receiving corps are still struggling to remember they can now run more than five yards down the field during a passing play. 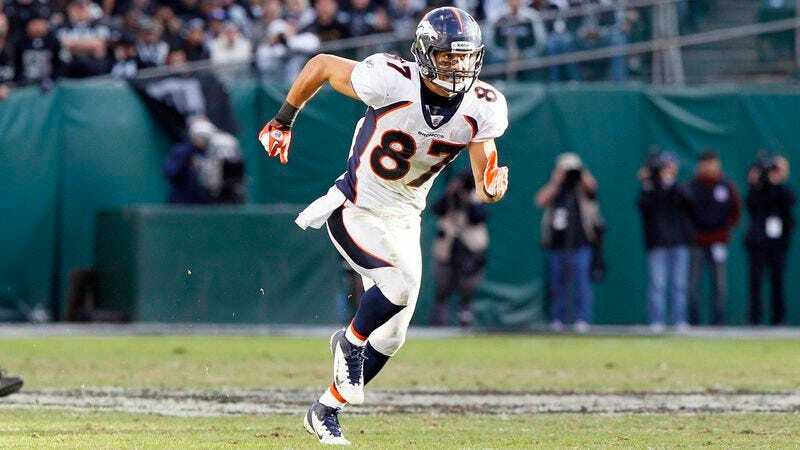 "I guess we just got really used to taking a few steps and then immediately starting to block the nearest defender," said third-year wideout Eric Decker, adding that he also has to occasionally catch himself from instinctively jogging off the field after every third down. "It definitely caught me off guard the first time I looked up in the middle of a play and saw the ball coming directly toward me and not 15 feet away. It's unusual, for sure, but I'm slowly getting used to tight spirals hitting my hands. I really like it, actually." When reached for comment, new Broncos quarterback Peyton Manning confirmed that he is having difficulty adjusting to receivers who drop every single ball he throws them.